Whether for private or government clients, VRHabilis crews work to all federal standards when performing our UXO projects. VRH offers unique solutions to environments with high levels of magnetic/conductive contamination. This allows us to tailor our technical approach to the client’s requirements and budget constraints. Since all of our employees started their career in the military or out on the range, our solutions are safe, “real world” practical and cost-effective. We optimize our quality control methods to ensure the utmost result for our client. At the beginning of each project, VRHabilis partners with our clients to design a solution that is compliant with all Federal, State and Local regulations. Our methodology, attention to the health, safety and welfare of our employees, and planning for potential hazards are all documented in our Work Plans, Site Specific Health and Safety Plans, and our Activity Hazard Analysis documents. Our solutions are creative and unparalleled in the industry for its attention to safety, detail and efficiency. By adapting common tools to our own needs, we have invented methods that safely and thoroughly clears a region of all scrap metal and unexploded ordnance. Our UXO Technicians and management staff are all HAZWOPER Certified, have their First Aid, AED, Emergency Oxygen certifications and all have passed the pertinent Occupational Physical for their specific tasks. Our projects are well documented in both writing and photographic records, both available for our clients’ review. With all the budget cuts at the Federal government level, many of our military ranges have been decommissioned and are no longer in use. 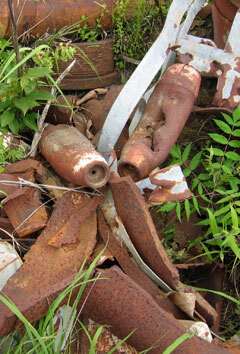 In order to return this property to a healthy, sustainable and safe place to live, scrap metal, UXO and other contaminants have to be removed. We at VRHabilis are unlike any other company in this field. Since the company founders and our employees come from a military background or have worked out in the field, we are uniquely able to create UXO solutions from a real world perspective centered on our clients’ vision, instead of one gleaned from a textbook. Our crews work efficiently and accurately with the most up to date equipment on the market. And if the tool we need doesn’t exist, we invent and patent our own.